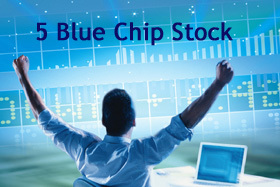 Blue Chip Stock– Stock market is easiest way for wealth generation provided you invest in right blue chip stock. Rakesh Jhunjhunwala and Warren Buffet is live example of wealth generation from stock market. They are successful in stock market because they have selected right blue chip stock for investment. Today I will share information about top 5 blue chip stock. I have invested in this stock few years back and this stocks had made me wealthy. L&T is first blue chip stock that made me wealthy. L&T is leader in capital good sector. L&T is well diversified company doing business in almost every sector. I have purchased this stock in 2004 at 523 Rs/- price. This stock has flourish my portfolio like anything. Stock has reached level of 4460 Rs/- in 2007. After stock split it is currently trading at 1746 Rs/ level. This blue chip stock is expected to deliver even better performance in future. Second blue chip stock in line is pharma company stock Lupin. Lupin is doing extremely well in Indian and in global market. I was bit late in doing selection of this stock. I invested in this stock in year 2013 when stock was trading at level of 620 Rs/- & within 2 years of span this stock has given 200% return to me. Current market price of Lupin is 1860 Rs/-. I recommend blue chip stock Lupin for investment. It is also all-time favorite stock of Rakesh Jhunjhunwala. Infosys is best blue chip stock of IT sector. This stock has given magnificent return in past. In 2002 stock was trading at Rs. 500 today stock price has grown by 5 times. In between bonus is given two times. I was investor in this stock in 2010 but unfortunately I have sold this stock due to personal reason. IPO investor of this stock is carorepati now. Continues growth and demand in IT sector make this blue chip stock attractive. I expect this stock continue to perform better. Eicher Motor is another blue chip stock recommended for investment. Eicher Motor is makers of royal Enfield Bike. You will not believe growth rate of this company. Stock price of Eicher Motors in 2001 was 17.50 Rs/- and today it is 16,130 Rs/-. I have purchased only 10 share of Eicher Motors in 2014 at 4,400 Rs/- and within 1 year of short span got return of 300%. I wish I could have purchased more stock of Eicher Motors. If you see stock chart of Eicher Motors it will be like exponential graph increasing day by day. Today stock price is very high but still if you have money you can purchase this blue chip stock. Sun pharma is last blue chip stock recommend from my end. Sun Pharma is pharmaceutical company. Unfortunately I am not investor in this company but believe me looking at history I can surely say that this stock is one of the wealth generation stock. In year 2011 stock was trading at 250 Rs/- and currently stock is trading at 1010 Rs/-. I recommend to invest in this stock. What do you think about stock mentioned above? Do you know any other blue chip stock? Do share with us. Apart from these blue chip companies, my fav. are Maruthi, M&M and TCS. Great to see your achievement. I would recommend one more good stock with strong fundamental i.e. NTPC.